Vijay Theri fastest to 5 million views for a teaser. Home/NEWS/Vijay Theri fastest to 5 million views for a teaser. 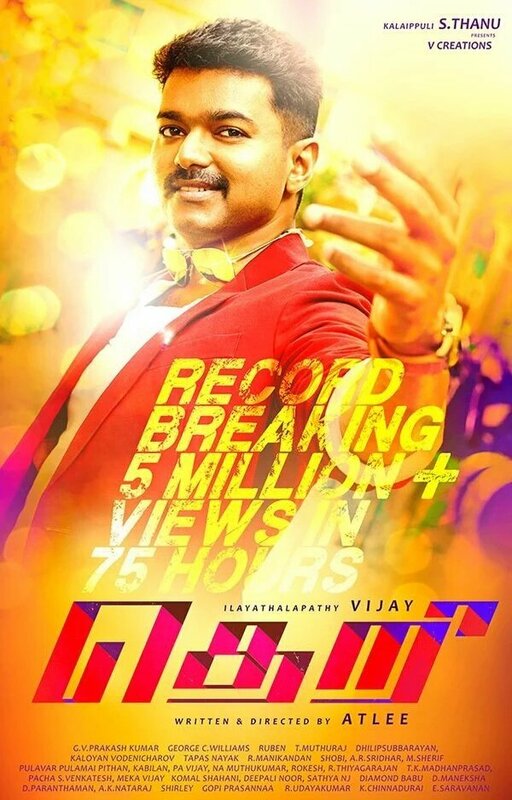 Vijay Theri fastest to 5 million views for a teaser. Vijay’s latest movie Theri teaser made a sensation in Youtube. The fans have gone crazy with Theri, giving them what they wanted after Puli. Ilayathalapathy Vijay Theri movie teaser has been out few days back and within few hours it has beaten records of Baahubai and Ajith Vedhalam and got 1 million views in just 12 hours and 5 million views in just 75 hours. The fans are on a high after the stupendous response the teaser has got and the expectations are just sky high for Theri. It has crossed Vedalam and also Baahubali records on youtube. Theri has created many records on Youtube by crossing Ajith’s Vedhalam not only that Vijay’s Theri has also achieved another big thing and it has beaten the Rajamouli’s epic film and India’s biggest motion picture Baahubali.